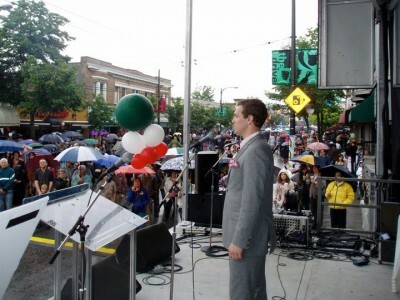 And on Sunday 6 June 2010, at the Mainstage on Commercial Drive at Second, we were pleased to participate in a long-overdue revival of Italian Day on The Drive. Produced by Tom Durrie, we presented soprano Mariana Valdés and tenor Nicolas Rhind, joined by City Opera staff pianist Greg Caisley, in a hour-long programme of Verdi, Puccini, Cilea, Donizett and Mozart. More than 200 people braved the rain, and loved it. Photos are available on our Facebook gallery.